Please scroll down for detailed accommodation information, location and directions, and prices and availability. Lebanon Cottage is accessed through a gate into the enclosed garden. From the front door you enter a small porch with downstairs cloakroom attached. 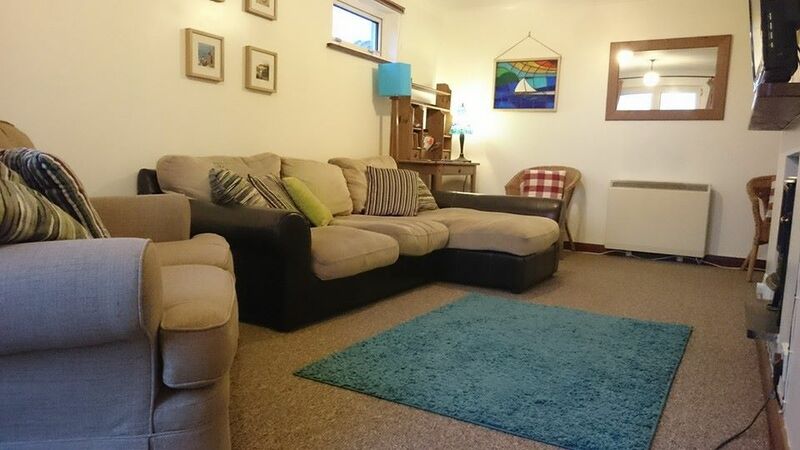 An internal door leads to spacious and comfortable living area with TV (with Freeview) and DVD/CD player. From patio doors there are views over the garden wall to the hills beyond. 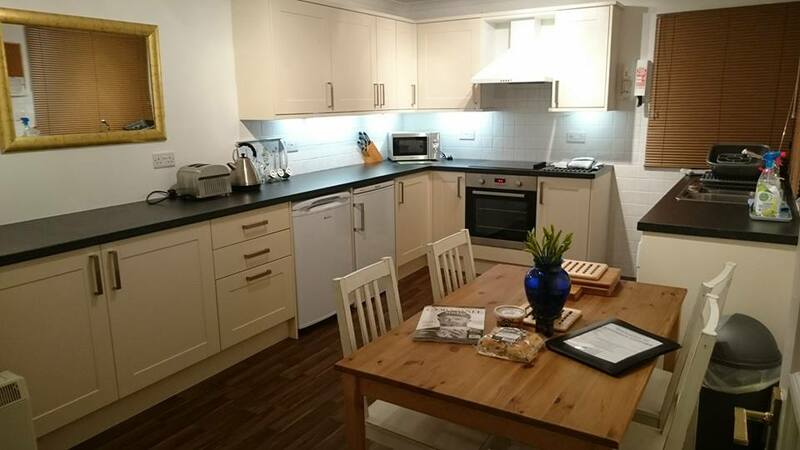 There is a large and well-equipped modern kitchen diner with washing machine, dishwasher, microwave, ceramic hob, fan oven, fridge and separate freezer. Upstairs there are three comfortable bedrooms, a modern bathroom with double ended bath and large walk in shower with instant hot water and a large airing cupboard with hanging space for damp clothes. The master bedroom has a king size bed and double aspect views to the Church and valley below. The twin room with two 3ft singles has views to the Church. For couples the twin beds can also be set up as a king size bed - please ask when booking. 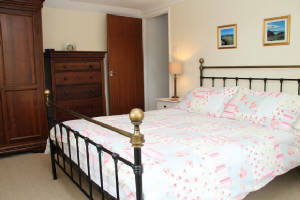 The single room with views to the valley and moors has a 3ft bed and some restricted height. Outside the courtyard garden is enclosed by a high wall and fence and has a set of patio furniture and bench. The garden is tiled and gravelled with shrubs around the outside. There is also a fenced off paddock where you can play ball games or exercise your dog. There is one parking space outside the cottage for a small to medium sized car, larger / longer cars can be accommodated on hard standing in the paddock next door to the cottage. Further storage is available in the paddock / garage for a small boat, jet ski, trailer, motorbike etc. Please call to discuss if you wish to use this facility. Accessibility: The accommodation downstairs is accessed via two steps from the garden to the front door. Dogs are very welcome Lebanon Cottage. The garden is enclosed by a high wall and fence. There is a fenced off paddock next to the cottage with lovely views across the valley that is exclusively used by guests for dog exercising. Dogs are generally not allowed to be left alone in the cottage unless they are crated. If you wish to go out for the day, we can recommend a dog sitting service. There is no limit on numbers of dogs in the cottage, but please mention you have dogs when booking. There is an outside tap to wash off muddy or sandy paws and a dog towel and shampoo are provided. Lebanon Cottage is a non-smoking property. We would like your stay to be as relaxing as possible. We have no meters and no extra charges. Prices are inclusive of electricity, heating, linen and personal towels (not beach towels). See below for further information. Lebanon Cottage operates a Friday changeover. The cottage will be available from 3pm on your arrival day and must be vacated by 10am on your departure day. Short breaks may be available out of season, please call for more information. For our Booking Form click here and full Terms and Conditions for Lebanon Cottage click here. Dogs are welcome by arrangement at no additional charge however a charge may be made if damage is caused. We are unable to allow cats at Lebanon Cottage. Other pets by arrangement only. A travel cot, portable stair gate and high chair are available - ask for availability when booking. Please provide your own mattress / bedding for the cot. All linen, towels (1 bath, 1 hand towel per person plus cloakroom and kitchen towels), tea towels and electricity are included. All beds have a duvet and two pillows per person. There is no phone available at the property, but there is a good signal for most mobile phones and a payphone is a short walk away. At Lebanon Cottage, one parking space is available for guests. Extra parking is available in the town car park a short walk away or, by prior arrangement only, in the paddock. Lebanon Cottage is fitted with panel heaters upstairs and storage heaters downstairs with an additional electric log effect stove in the lounge. Hot water is from an immersion heater with timer. Now with unlimited WiFi access. 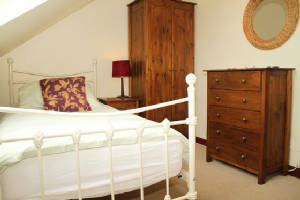 Lebanon Cottage is managed by St Just Holiday Cottages. The cost of holiday insurance is not included in any prices quoted on this site. You should seriously consider taking out holiday insurance for your holiday in case of cancellation. 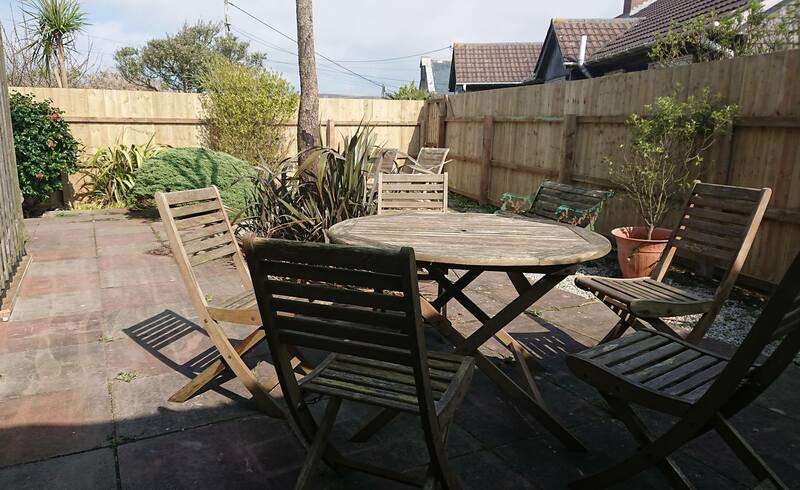 St Just in Penwith is approximately 4 miles from Land's End, 1 mile from the coast at Cape Cornwall, and 6 miles from the lively town of Penzance. Lebanon Cottage is marked on the map below (postcode TR19 7HA). Follow the A30 around Penzance taking the A3071 right into the centre of St Just. turn right into the Market Square. You will see a Warrens bakers and the Kings Arms pub in the far corner. Take the road between the two and continue past the church. You will see a large house in front of you and it looks like a dead end, but carry on down and you will find the road opens out in to a small square. Lebanon can be seen on your right hand side to the left of the field gate. Please park up in front of the white garage door, come through the wooden gate to the left of the cottage. You will find two further wooden gates inside. We are to the left - please ring the bell on the gate post - the cottage is the gate to the right. If you have not been to Lebanon Cottage before, and you arrive in the dark, it is easier to park up outside then give us a call and we can come out and get you. 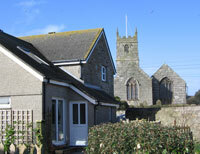 St Just Holiday Cottages - self catering holiday accommodation in St Just, West Cornwall.